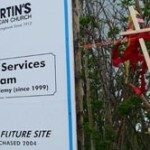 St. Martin’s is in the process of moving forward to build its new gathering space. We are blessed to have nearly 4 acres of land on the corner 17th Ave. and 89th St. SW. It is a beautiful site, and one that we hope will be a beacon of love, invitation to faith, and partner in caring for the wider community. We are following in faith our vision to be first and foremost a place of relationships: with God, with Christ, with the Holy Spirit, with each other, and with those who live around us, including the natural world. It has been a long journey, but we are hopeful for what lies ahead and the future God intends for us. We will be a place of renewal and responsiveness through inviting and beautiful worship; places for prayer and meditation; and opportunities for learning, growth and spiritual nourishment. We will integrate with our community to offer programs, services and space that meet its needs with compassion, dignity, and attentiveness. We are building up a house that wil have open doors every day of the week. We will build using sustainable and eco-friendly design and materials. Beyond our sanctuary we will dream and plan with community partners ways to make our parish a living centre, one that sees its life as interwoven with the lives of those around us. In time, we will expand our campus with new spaces. Our deepest hope is that all who meet us, no matter creed, religion, or life circumstances, will experience that the Lord is good. Parish Prayer for our future: Blessed God, who makes all things new: Grant that this community of Word and Sacrament may be the bread of life and hope for all we meet, and the wine of delight for hearts in need. Inspire us to be a gathering strong in outreach, tender in pastoral care, and joyful in praise. May we be open to the Spirit’s movement and responsive to give of our time, abilities and money to build our new place of worship and service. Help us always to be a community that listens and engages with your presence in our midst; through Jesus Christ our steadfast companion on the way. Amen. See the information board on Sundays at worship to learn more about the process and our progress!